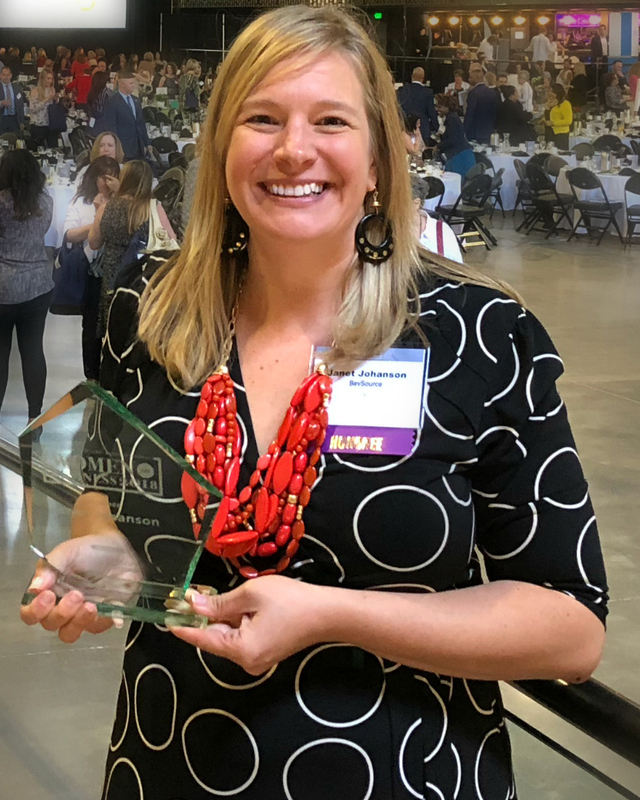 One of the beverage industry’s leading consultants, Janet Johanson was honored last week with the Women in Business Award by the Minneapolis/St. Paul Business Journal. This award honors industry-leading executives, entrepreneurs, and business owners in the Twin Cities. It recognizes their outstanding leadership, professional achievements, and community involvement. Throughout the past 16 years as founder, owner, and CEO of BevSource, Johanson has been the driving force behind helping BevSource’s clients launch hundreds of beverage products in North America and oversees. Her dedication to company growth and employee development along with her work to mentor others in business merited this award. Johanson is focused on cultivating an experienced team and incredible culture that enable BevSource to make it happen for clients every single day. She continues to propel BevSource to new heights, delivering the highest quality beverage development and operations solutions to new and established beverage visionaries. Johanson is passionate about volunteering with Junior Achievement of the Upper Midwest and inspiring future entrepreneurs to dream big. She also serves on the board of directors for Give Us Wings, an organization that transforms communities in Kenya and Uganda by providing financial assistance and empowering people through training that leads to economic self-sufficiency. Her commitment to excellence and involvement, both in the industry and community, commended her this prestigious honor.